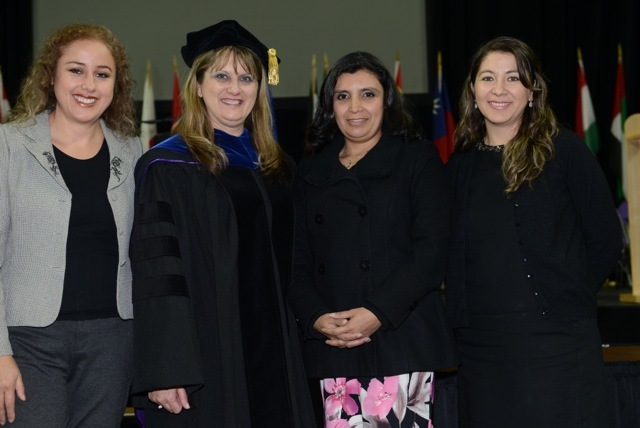 Three dignitaries from the Ecuadorian government attended the Graduate School's commencement on Dec. 12 in support of the 42 students from their country who earned master's degrees from the College of Education. Vanessa Lucia Calvas Chávez, undersecretary of education for professional development in the Ministry of Education, was delegated to represent Minister of Education Augusto Espinosa. Monica Del Pilar Palacios Bernal, general coordinator for English language development in the Ministry of Education, also attended. Geannine Claudé Alvarado Romero, director of scholarship coordination, orientation and design in the Ministry of Higher Education, Science, Technology and Innovation, was delegated to represent National Secretary of Higher Education René Ramirez. "We are honored to assist the Ecuadorian government in its aggressive goal to train ESL teachers and its commitment to education," said Debbie Mercer, dean of the College of Education. "I also want to thank the faculty in the department of curriculum and instruction for their support of these special students who return to Ecuador as advocates for educational change." • Theory-into-practice applications of concepts. • Cross-cultural experiences with teachers in Manhattan-Ogden USD 383 and Geary County Schools USD 475. • Research, including white papers on identified problems with proposed solutions, to improve their nation's education system both locally and nationally.